If you’ve been blessed to visit the Holy Land, you’ll understand why Diana von Glahn, aka The Faithful Traveler, has created a new television series about it. Titled A Papal Pilgrimage to the Holy Land, von Glahn’s three-episode masterpiece trails Pope Francis on his historic pilgrimage to the Holy Land in May, 2014. Diana and her husband, David, work together – a team both on and off camera – and their mutual love for each other and their work shows in everything they do. I had the gift of meeting up with Diana while I was in Israel and Palestine during the Papal Pilgrimage and also on a subsequent trip to Jordan. It was fantastic to be able to observe her working at her craft. I recently had the pleasure to do a Q&A with Diana about her experiences in the Holy Land, her love for film making, and the back story of the project and her work in general. 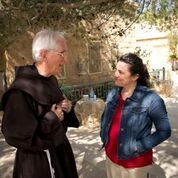 A: After our second series, The Faithful Traveler in the Holy Land, broadcast on EWTN in February 2014, it was seen by someone at the Israel Ministry of Tourism. 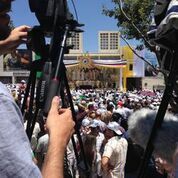 They invited us back to the Holy Land to film parts of Pope Francis’ pilgrimage that May. The Jordan Tourism Board covered our time in Jordan, and Voices of Faith Tours covered our time in the Palestinian territories. We had a very short time to prepare and get the necessary permissions to film in the sacred sites and at the parts of the Papal pilgrimage to which we would be allowed entry. It was exciting, but stressful. We were there about a week before the Pope arrived and then a week after, to get shots of some of the many sacred sites we cover in the show. Q: What is it about this particular film series that you’re most excited about? A: Although this series is a departure from our normal travel series in that it covers history, has a lot of interviews, and covers an event, I think I was able to both capture the spirit of the Holy Father’s pilgrimage and use that to encourage people to visit these sacred sites, which is always my primary goal. The motto of the Papal pilgrimage was “that they may be one”, from Jesus’ prayer to His Father during the Last Supper, in John, Chapter 17. The Holy Father’s pilgrimage commemorated the 50th anniversary of the meeting between Pope Paul VI and Patriarch Athenagoras, but that motto also went beyond just the unification of Christians. It was applied to the unification of all of the people in the Holy Land, as well—Jews, Muslims, and Christians. We are ALL children of God, and that message resounded during the Pope’s visit, and I tried to make that clear in the series. So many people are afraid to visit the Holy Land, which is such a shame because if there is any place on earth a Christian should visit, it is the land where God became Man. But it is also understandable, given how the news only covers the negative—and does so with such repetitiveness. It’s easy to think nothing but violence and hatred comes out of the Holy Land. That is not the truth, and I hope that this series adds one more brick to the argument to convince people to go and make pilgrimage to this, the holiest place on Earth. Q: What most impressed you about the Holy Father’s words/actions during his pilgrimage? A: He wasn’t speaking much English at that point, so I had to do my best to understand his Italian! I remember the excitement at Manger Square in Bethlehem, when he invited the Presidents of Palestine and Israel to his home at the Vatican to pray for peace. That was awesome. It happened, and a month later, they were fighting. The devil doesn’t like peace, and he certainly doesn’t want it in the Holy Land. But nothing is impossible with God. Q: Of all the places you’ve filmed in the Holy Land, what’s your favorite? A: That’s tough. My favorite place to film in the Holy Land is the Church of the Holy Sepulchre. We got to stand in front of Calvary for a good 45 minutes, filming little bits and bobs. Normally, pilgrims whiz past it, touching the rock, then leaving so as not to hold up the line. But with permission, we could linger. That was such a blessing. Honestly, I think my favorite place to be in the Holy Land is wherever I am with locals. They make every place magical, because they bring to it their love and pride of place. I met so many locals on this trip—Jewish, Muslim, and Christian—and they all showed me their hearts when they showed me their homes. It was a true blessing. Q: Before the production, your husband had a heart attack and you nearly quit. There were some other obstacles as well. How did you handle that? A: Nine days before we were set to depart, David—who is my main cameraman and director—suffered a heart attack. Then, another cameraman came down with the flu, so we went from a team of 5 to a team of 3. At first, I thought, “he’ll get better, and he can come and we’ll take it easy!” While he did recover, the doctor thought it best he not make the trip, and David was glad—albeit bummed—to stay home. David told me to go, and so I went. I think I cried every night on this shoot. My poor cameramen bore the brunt of my short fuse and moodiness. It was very, very difficult. Aside from the emotional aspect, from a production perspective, all of my plans were thrown into disarray. I had planned for a production team of five—I ended up with a team of three. Things had to be cut and rearranged, all while I was worried whether my husband would live or die. As the host, I also had to be happy and think fast on camera. A year later, I returned to Jordan to pick up some footage—you were there! That trip was stressful and there were aspects of it that were equally soul crushing, for other reasons. But I got through it. I’ve come to expect this kind of interference from the devil whenever I try to do anything with The Faithful Traveler. That doesn’t make it any easier, but at least I can say, “oh yeah, it’s you. Go away!” I prayed the rosary every morning in the Holy Land, and prayed to myself whenever I was alone. That kept me from falling apart. Once I got home, I prayed throughout the writing and editing of the series. Without prayer, this series would never have been started or finished. Q. You have a law degree. How is it that a lawyer ends up becoming a film host and producer? A: I was never meant to practice law. I’m what happens when a kid has a silly idea based off of watching TV and isn’t blessed to know anyone wise enough to convince her out of it. That said, I’m sure I wouldn’t be where I am without that experience. I never would have met David, and without him, The Faithful Traveler would never have come to be. The long and short of it is this—I made a decision and was too stubborn to quit, as much as I hated it. Eventually, I faced the facts, quit, and moved on. The artistic and storytelling sides of my personality took over, and a show was born! Q. What motivates you in your work? A: My primary goal with The Faithful Traveler has only ever been to bring glory to God, to show people who don’t know how amazing He is, and what a wonderful gift is the Catholic Church. After that, I produce the show because I feel the need to share the gifts I have been given—my faith and the opportunity to travel—with those who have not been given those gifts. I think I would burst if I couldn’t do that. A: I am currently finishing up the first of our new series The Faithful Traveler in Portugal, beginning with the biggie: Fatima. Each episode will explore some of the many amazing sacred sites that beautiful country has to offer that so few pilgrims see. Then, we hope to begin filming the California Missions in the Fall. After that, God only knows. Holy Land, The Faithful Traveler, Travel. Bookmark.